Average Height	: 15" - 21"
They are members of the herding group and were bred to move sheep in the French mountains they were named after. However, many Pyres seem to exhibit a terrier-like personality: they have a high prey drive in general, love to bark, and have an uncanny ability to manipulate people to get what they want. •	Their temperament varies greatly. •	Need an owner ready to put in a lot of time training & exercising them. •	Originally bred to alert guard dogs of threats, they are barkers. •	There is a fine line between being suspicious and out of control 'fear-barking' or aggressive barking. •	Can be very cautious of other people during their mature growing spurts. •	Not a dog for less experienced dog lovers. •	Good in any size living space. Needs plenty of mental and physical stimulation. •	Is not a dog to be left alone for many hours. Can develop separation anxiety and destructive nature. •	Not a breed to be left outside alone. •	Love dog sports, agility, obedience, herding, etc. •	Lots of stamina, great jogging partner. •	Great 'trick' dog ~ learn quickly. 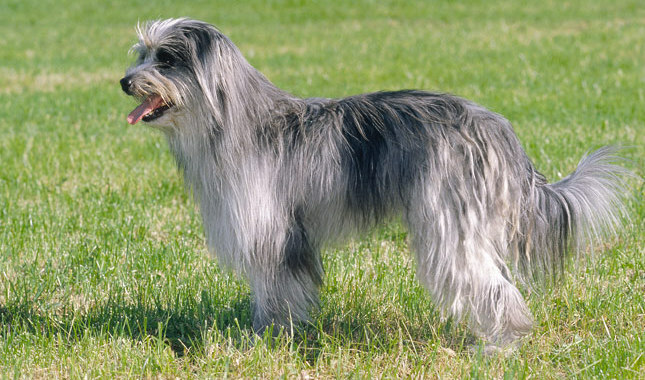 Like all breeds, the Pyrenean Shepherd’s temperament is a very complex matter. They vary greatly from different lines to different techniques used to raise them and how much exercise, both mental and physical, they are given. They are intelligent and are not the type of dog for an owner who does not wish to put a lot of time into keeping them mentally challenged and very well exercised. You should be warned that this breed was originally bred to alert the guard dogs of any possible threat. Because of this, they feel it is their duty to bark at anything and everything that comes within proximity of their yard or their people. There is a fine line between due suspicion and out of control fear-barking or aggressive-barking and dogs need to be taught what is acceptable barking and what is not. Even with proper socialization, Pyres can still go through a long teen phase where they are very cautious of people before they mature and settle down at around 2 years of age. Anyone wanting a Pyre needs to have the time and patience to possibly dedicate months to training and developing a well-adjusted dog. The reason they seem so obedient to people that meet them is because they are often only bought by very experienced, dedicated dog trainers that spend a lot of time and energy shaping the dog’s behavior. Anyone with little training experience that just wants a companion should either consider a less difficult breed or do a lot of research on dog behavior and positive training methods.